The latest valueline report makes very sombre reading: "The economy is now in a deepening slump, which is now characterized by issues of viability in the troubled auto sector, by the need for a monumental bailout of ailing behemoth Citi-group, and by further reversions on the housing market, where existing home sales resumed their decline in October and prices fell by the most on record. Given this dour backdrop, it is not surprising that we expect the downwardly revised .5% decline in third quarter gross domestic product to be followed by a materially large 3%-5% set back in GDP in the final three months of the year. The news is likely to get worse before it gets better." Now that the new president is in waiting with the US elections over, the fact that we did not get a sustainable rally is not a good indication of future market performance. It would appear that the bull sentiment is hiding, though may make a minor run at the start of the New Year. However, with economic fundamentals so weak, any rally will present an opportunity to sell rather than buy. It would appear to me that the deflation story being told by the collapsing availability of credit has many chapters left to be written. The nature of this recession will appear more like a depression than a standard business cycle contraction. The systemic problems in the economy will be solved but it is going to take time and paper. It is obvious that the prescribed medicine will be inflationary once the capital asset and commodity deflation stage is concluded. As a result the US dollar will probably be weaker but less weak that the other free floating fiat currencies. As Ludwig Von Mises pointed out, the gold-less money issue is not who is strong but who is the least weak. As long as the US dollar is the reserve currency it is obvious that the international game favours this political heavy weight. How long the situation will continue is any bodies guess but the degree of corruption associated with the issuance of "AAA" rated bonds, connected with American institutions, has rocked the system to its core and future survival will probably dictate a more internationally accepted accounting regulatory mechanism going forward. Until the situation stabilises this is a traders market rather than one for investors. This is due to the fact that it is too early to say whether the recession is fully discounted by current price levels. It is my contention that it is not. This being so, sentiment could turn on a dime, and carnage could ensue. Such volatility is a traders dream but is not for the meek hearted. Many believe gold and silver are good plays here. Fundamentally I agree but it is obvious the development of Exchange Traded Funds for these money metals has allowed the paper price to be shamefully manipulated. This makes trend trading with stop-loss-risk-management very difficult given the erratic nature of price movement. Synaptics develops and supplies custom-designed user interface products and solutions that enable people to interact with various mobile computing, communications, entertainment and other electric devices. Its touch-sensitive pads and other products are sold to PC and mobile phone manufacturers, as well as to other consumer electronic OEM's. The company closed out fiscal 2008 on a high note. The company's forth-quarter revenues jumped 35% year over year, driven almost entirely by strong sales of its cell phone touch screens. The company continues to roll out innovative products. Synaptic's new technology called Proximity Sensing allows hidden touch sensitive icons to light up when a user's hand gets close to volume controls on a monitor or remote control, for example. This permits sleek designs and power saving since icons don't always need to be illuminated. Historically, SYNA has been first to market with many popular technologies, which helps explain its 60% market share in laptop touchpads. Incidentally the board of directors recently split the stock and authorized more share repurchases. 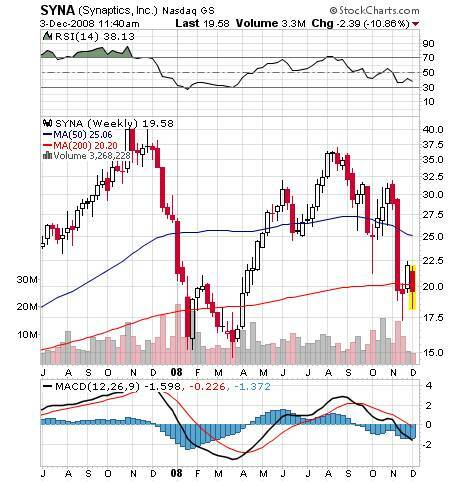 We recommend putting SYNA on your watch list and await the standard wealthbuilder bullish engulfing buy signal. Please read our disclaimer and trading rules before taking any investment decisions.